When you start to focus on gluten-free eating, it’s easy to feel like you’re leaving behind a lot of breakfast favorites. That’s why I’m so grateful for these indulgent sweet potato waffles. Pancakes, french toast and waffles, though delicious, are generally void of nutrients, high in sugar and made with refined flour. Unfortunately, the traditional form of these recipes don’t really have a place in a truly conscientious diet. Kicking the white carbs, however, doesn’t have to mean you’re doomed to boring breakfasts. I should mention though, while breakfast is certainly one option for these sweet potato waffles, I’d recommend you save them for dinner. Here’s why. If you’ve given up pancakes and waffles, don’t mourn. Pull out that waffle iron and cook up these easy 3-ingredient sweet potato waffles! Note: You don’t need a waffle maker to make this paleo waffle recipe–simply keep the ingredients and make sweet potato pancakes instead! Made with just sweet potatoes, eggs and a little bit of coconut flour to hold it all together, this recipe is fantastically simple and so good. Serve it up sweet, with a pat of coconut oil and a bit of pure maple syrup. 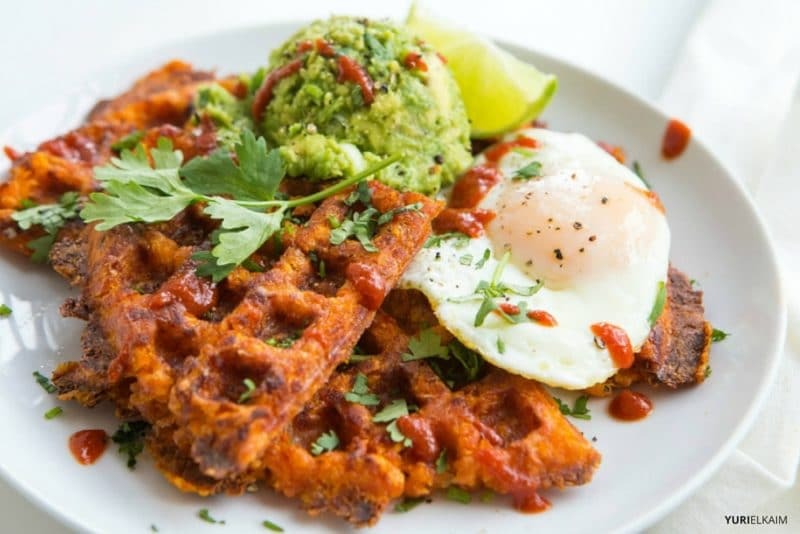 I also consider this one of my healthy dinner recipes as well; that’s because you can go savory, topping your sweet potato waffles with a fried or poached egg and dollop of guacamole. You’ll feel like you’ve just dished yourself up a plate of sinfully satisfying diner food, but will actually be enjoying a nutrient-packed breakfast that will keep you satiated all day long. Psst: Need breakfast in a snap? Check out my 1-ingredient 100%-vegan hack of this recipe down below. Contain no saturated fats or cholesterol, and is a richer source of dietary fiber, anti-oxidants, vitamins, and minerals than potatoes. Has higher amylose to the amylopectin ratio than found in regular potatoes. Amylose raises the blood sugar levels rather slowly on comparison to simple fruit sugars (fructose, glucose etc), which makes sweet potatoes a healthy food item even for diabetics. Provides a good amount of vital minerals like iron, calcium, magnesium, manganese, and potassium that are essential for enzyme, protein, and carbohydrate metabolism. Full of carotenoids, which are powerful antioxidants connected with cancer prevention and anti-aging. 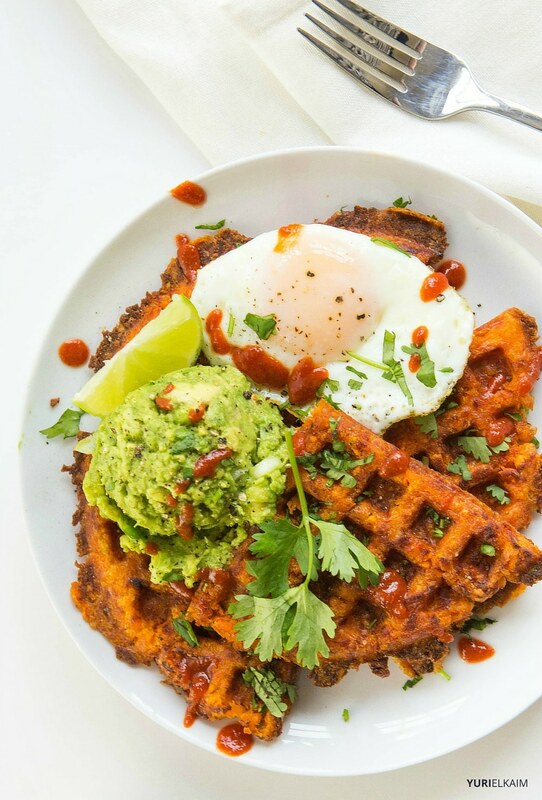 These savory sweet potato waffles are made with just three basic ingredients. On top of that, they're 100% plant based, paleo and satisfying. Preheat waffle iron. In a large bowl, stir together grated sweet potato, one egg, coconut flour and 1/2 teaspoon salt. Spray waffle iron generously with nonstick spray. Spoon one half of the sweet potato mixture into the center of the waffle iron. Close the lid and cook for 5-8 minutes, or until the waffle begins to turn medium golden brown. Remove waffle and repeat with second half of the batter. While waffles cook, poach or fry eggs. Peel and pit avocado. Mash together with diced green onions and lime juice. Add salt and pepper to taste. Drizzle with hot sauce, if desired. Here's a super-quick, vegan shortcut: Purchase a pack of frozen organic sweet potato tater tots. Press 30-40 tots between your waffle iron, cooking until golden. Boom! 1-ingredient sweet potato waffles, made in just five minutes!